Wine crystals, wine diamonds… why are they in my wine? While they may look like a fault, these crystals are completely natural, harmless and generally tasteless. They are technically potassium bitartrate – a crystalline composition of tartaric acid and potassium hydroxide. 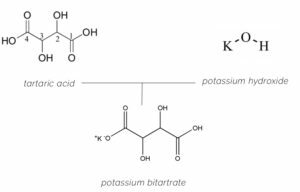 Potassium bitartrate is more commonly known as Cream of Tartar, and is frequently used in baking. While quite rare in nature, tartaric acid is the primary organic acid that occurs in grapes (malic being the other). Grapes are also naturally high in potassium. When these occur together in a solution, they quickly form a bond and create the tartrate. This can either remain dissolved in the solution, or crystallise (the cooler the solution, the more crystals will form). We rarely consider the chemical constituents of the wine we drink – although it is technically a food product, there are never ‘ingredients’ listed, nor a chemical breakdown shown on the label. But wine is generally a combination of water, alcohol, acids (around 0.5%), glycerols (a form of alcohol) carbohydrates and phenolics. While it is possible (and indeed is standard practise) to remove potassium bitartrate crystals (using process called cold stabilisation, where the wine is chilled to just above freezing point and all tartrates racked off) this is usually avoided with red or rosé wines, as some of the essential components (chiefly pigments and tannins) are lost along with the offending tartrates. In summary, these crystals are natural, completely harmless and generally tasteless. If found only on the cork, these will not affect your drinking experience. If they are at the bottom of the bottle and you would prefer to drink your wine sans crystals, they are easily removed by decanting the wine carefully and discarding the crystals.